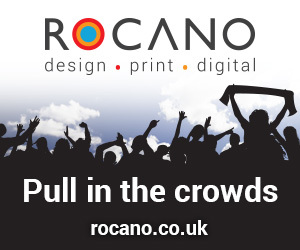 Download SJFL Club Directory here. 13th May 2018, date/venue tbc. 20th May 2018 held at The Venue, Oswestry (Home of The New Saints FC ). 7th January 2018 – 4th March 2018 held at Shrewsbury Sports Village. (GROUP STAGES[*] – all teams (U12-U16): 3/12/17 – 7/1/18 – 11/3/18 – 25/3/18: Semi-Finals 22nd April 2018. [*] Rule 10(J)(i). League & Consolation Cup will be played in a ‘Cup Group Format’ – similar to Champions/Europa Cup Format- covering the respective age groups of teams rather than by separate divisions within age groups. The ‘Group’ stages will produce teams to go forward to the semi-finals (draw will be made using FA Full-Time). The four winning teams from each group stage will contest the League Cup & the second placed four teams will contest the Consolation Cup. If less than four groups; 4x best placed teams will contest League Cup and next 4 placed teams Consolation Cup. 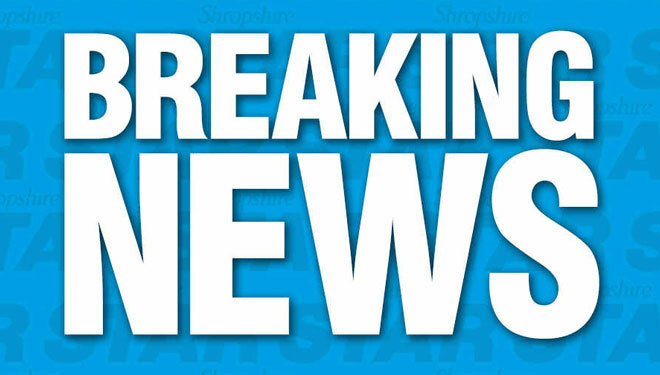 Follow the Shropshire Charity Cup 2017-18 draw and results here. Download Club Directory TYJFL here. U13 & U14: (Managed by SJFL) – Finals 29th April 2018, held at Greenfields Stadium. Market Drayton (home of Market Drayton Town FC). U15 and U16 Finals managed by TYJFL – Dates/venues tbc). This award recognisee the hard work, dedication and commitment that Nicky does in running and administrating a junior football club with over 20 teams from crèche to U18. A demanding role in which she carries out with a professional approach at all times. 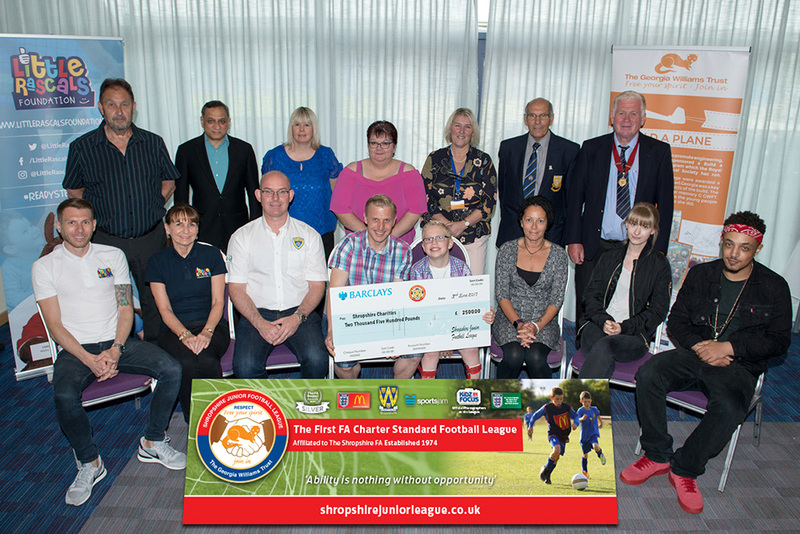 The cheque presentation was made by Officers of the League, Georgia Williams Trust and Shropshire FA President. SJFL has now raised over £27,000 this millennium alone and gifted 60 charities. Prees Junior Football Club has over 200 boys and girls playing football. 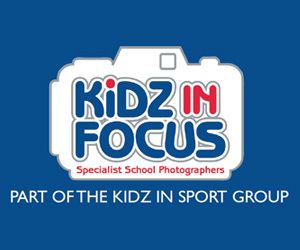 The boys section is running a crèche and has teams from u8 – u16s. The U16s, who’ve been together since crèche, have players completing FA Level 1 coaching badges and helping with crèche, other teams and also refereeing. The Girls section is also thriving with three teams (next year we will add u14s) and this year the club will hold its second annual girls tournament, where all monies raised go to various charities. The annual tournament for boys is also well under way. 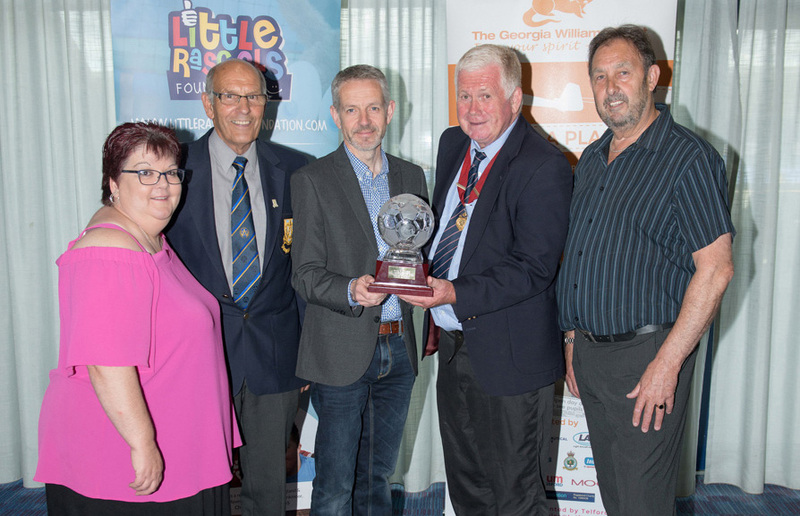 The Club has a dedicated committee to ensure that the club will be around for a long time and encourages all our players to get involved in supporting the club, completing courses and giving something back to the club. PJFC is a community club and is a little piece of paradise in the countryside where everyone is always welcomed regardless of their ability and we have children who just come to train. 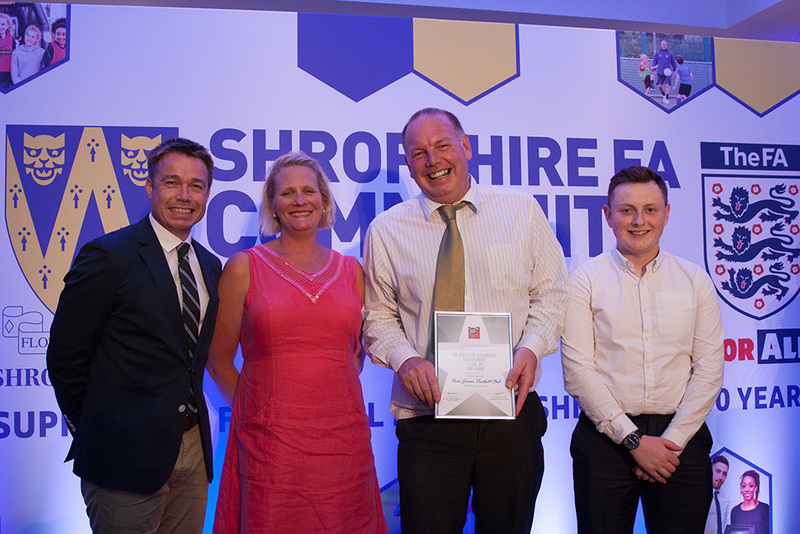 Shrewsbury Juniors celebrates its 40th anniversary this year and are putting on a number of events to celebrate, including a evening dinner party with Paul Merson the celebrity guest. The club continues to provide football for all, with 30 teams for boys and girls, also adult’s men’s and women’s teams. The club continues to start new teams, if the demand is there, and 25 boys and girls completed a JFL (Junior Football Leaders) course. These leaders help and support club events and this season they’ve run two crèche festivals where these young leaders have refereed. The club invests in all the coaches, supporting them to achieve their own goals through qualification. Investing in young referees, where the club appoints them to club games and then supports them in officiating league games. 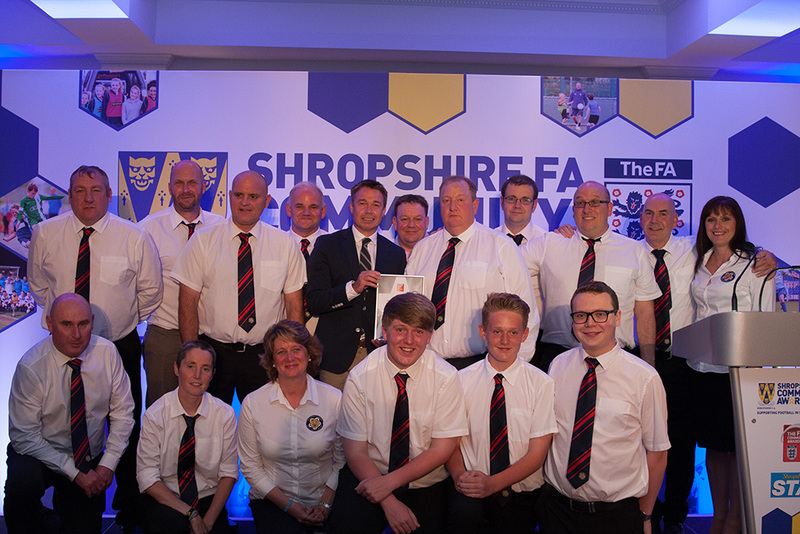 Shrewsbury Juniors Football Club is run by a committee of 15 members and these volunteers work tirelessly to provide football for all. Kick It Out (Lets kick racism out of football). SJFL promoted Kick It Out Campaign Day held at the Shrewsbury Sports Village as part of the Shropshire Junior Football League’s Futsal Respect Festival, in partnership with the Georgia Williams Trust, Shropshire FA Youth Council, Shropshire Football Association and Sportsjam. It was a great opportunity to promote and raise awareness of the ‘Kick It Out’ campaign and was a fantastic success with over 100 players, managers / coaches and supporters uniting together in this event. The Kick it Out Campaign aims to deliver the message of inclusion and anti–discrimination within the football, educational and community sectors encouraging inclusive practiced and work for positive change. 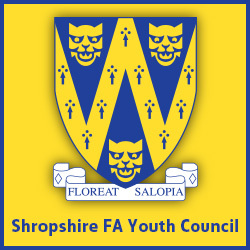 Shropshire FA Youth Council were delighted to partner the Shropshire Junior Football League and Georgia Williams Trust to support the delivery of their Kick It Out. Players also received badges, arm bands, wrist bands and other promotion material as a reminder of the day and the importance of Kick It Out. 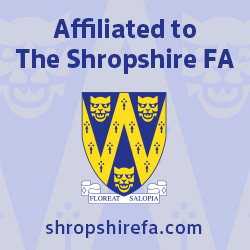 SJSJFL provides football for 20 clubs and 174 teams – all FA CS – and 2300+ players registered (FA Pilot League – Whole Game Player Registration System), development football (U8–U11) and open competition fixtures U12-U16 (including Shropshire Charity Cup (U13/U14), four Charity Trophy festivals for U10/U11s and a mid-winter ﬁxture break December/January. The League has 100% coverage by registered referees for all age groups as part of the National Referee Development Partner League (ﬁrst for Shropshire/West Midlands Region). SJFL also provided a ninth Respect Futsal Festival (and U7/crèche introduction to Futsal) for 70 teams, 134 ﬁxtures over 650 players participating within the league’s CS player development programme. 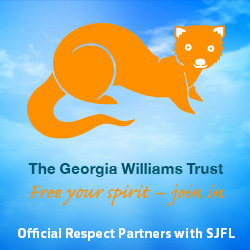 The League is honoured to have ‘Respect’ partnership with Georgia Williams Trust that promotes respect not just in football but also the wider community. 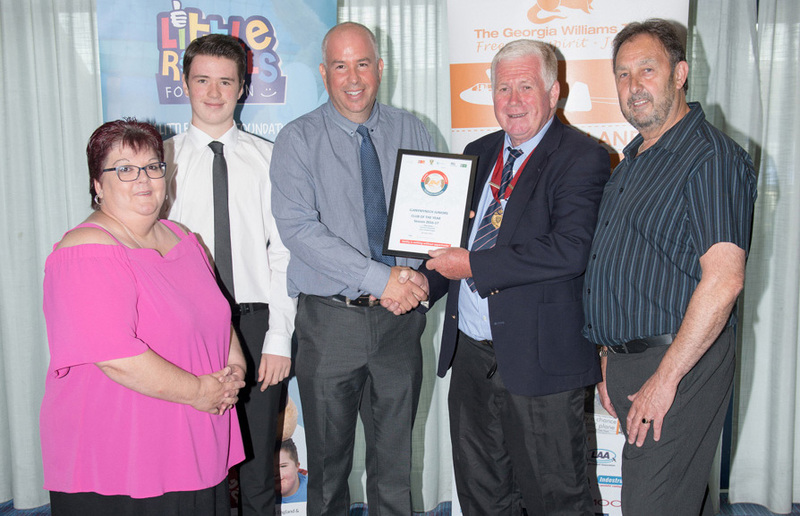 FA Silver Respect Accreditation in 2013 (reaccredited in 2015). Being the ‘ﬁrst’ FA CS League (2009) SJFL continues to be at the forefront and was the First county league to implemented Respect Marshalls and have collective responsibility to create a fair/safe/enjoyable environment in which the game takes place. STITC support match-day Respect sponsorship (U8-U11s) and reward the league’s monthly winning respect team with match-day vouchers for home games at STFC (in partnership with STFC/SFA). 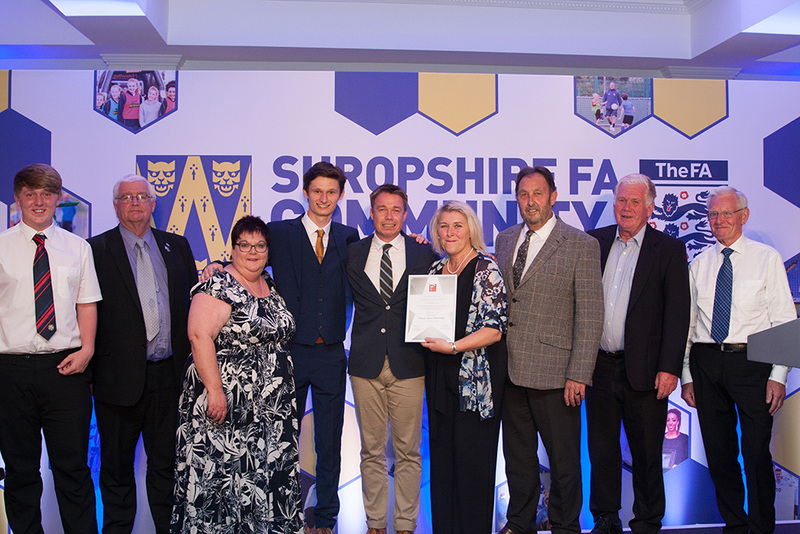 SJFL is committed to inclusivity/eliminating all forms of discrimination and delivered ‘Kick It Out’ campaign at its Futsal Respect Festival and was honoured in 2016 at the Mayor of Shrewsbury’s Awards – receiving Gold award to SJFL in recognition of their achievements towards enhancing the wellbeing of young people in the area with excellence in their volunteer workforce contributing to the league’s successes. 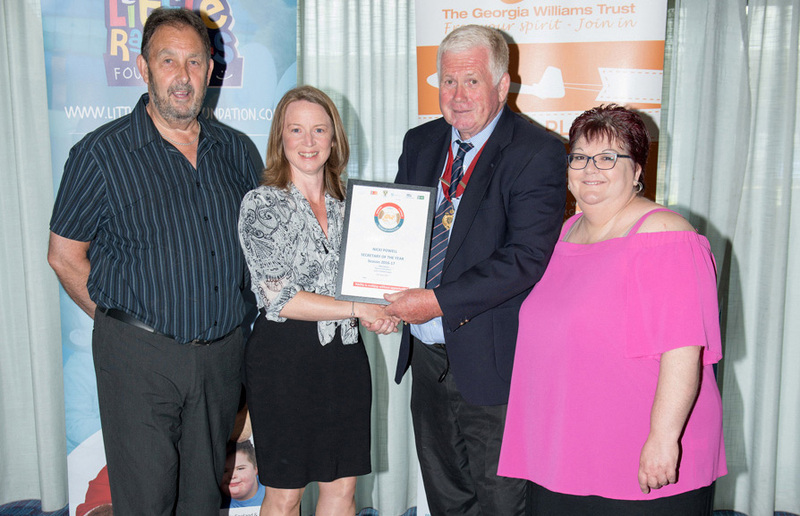 Since the new millennium SJFL has raised over £25000 and gifted 55 charities. 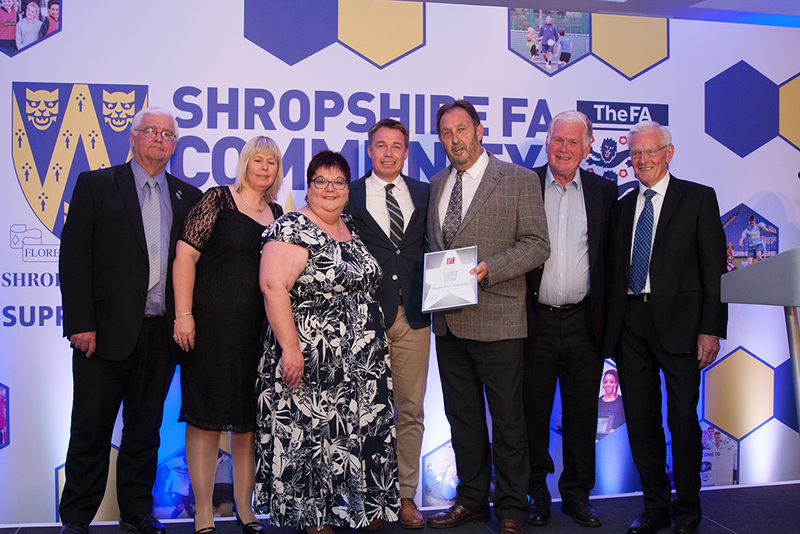 In further recognition of the SJFL outstanding contribution to community football the league was also awarded the FA Midlands Regional CS League of The Year 2017 (The McDonald’s FA Community CS League award for Shropshire and West Midlands). 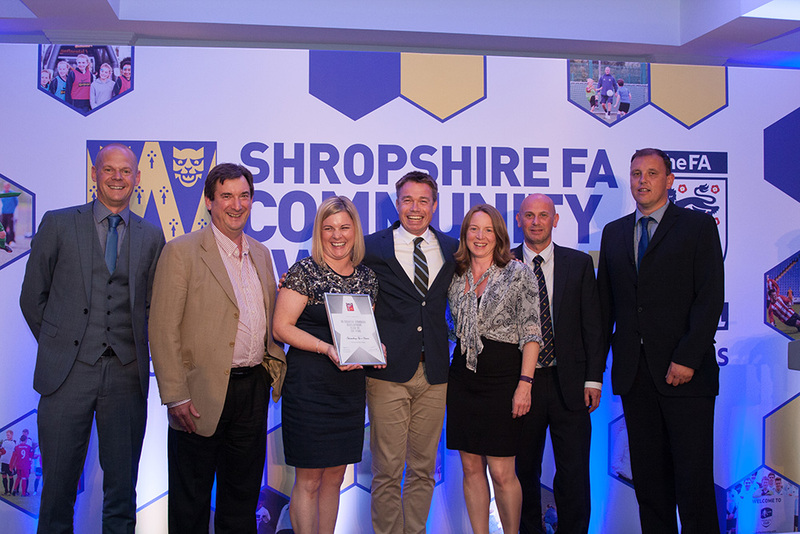 This is the third time the league has received the regional award since 2010 and the seventh consecutive year in being awarded the FA CS League of the year.